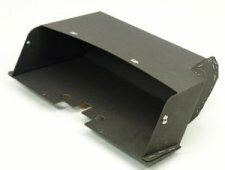 New replacement glove box liner for all models 1967 - 1969 Camaro, Firebird, Trans Am Available with or with out air conditioning. New replacement glove box liner for all models 1967 - 1969 Camaro, Firebird, Trans Am. Available with or with out air conditioning. NOTE: Use the drop down menu boxes to select car make, year and with or without factory AC. Constructed of heavy grade pressed cardboard and stapled just like the GM issued unit! NOTE: Allow 10-21 days for delivery.